Welcome back to the July edition of my internship blog posts for GWL! This month, Glasgow faced a very sunny and even (undeniably) hot few weeks and I hope that wherever you are, you could enjoy sunbeams and ice cream, too. With that being said, I am sad to notice that July not only marks happy times, smiles and a slightly more loose schedule for me, but also the turning point from the first half of my internship to the second half of it – which basically means I have to say goodbye sooner than I want to! But let us forget about this for a moment and recap my experiences from the last four weeks. As you veeeery likely may have heard from various tweets, blog posts and visits to our library, GWL was shortlisted for the Museum of the Year Award (for a fancy abbreviation, try MOTY). The whole experience was very intense and came to its culmination at the beginning of July two months after our press release. We had a last minute BBC video shoot at GWL, many interviews with journalists and basically all of us turned into next level whirlwinds. At last, many of our members of staff travelled to London for the official prize giving ceremony on the 5th July. Those of us staying home – members of staff, interns, volunteers and friends of the library – kept crossing our fingers like crazy until 10pm in the evening when the winners were officially announced. Unfortunately, the lucky winners were not us but the Tate St. Ives gallery . Congratulations to you! Yes, it is sad we did not win but what we gained is much bigger. First of all, we all gained a new perspective on what GWL is actually achieving and is aiming to achieve in the future. A perspective which, without a doubt, is now shared by a higher number of visitors too. And, most importantly, we created even stronger bonds than before within GWL- across all levels of involvement! We are now flourishing in an enhanced level of trust for each other and passion for the feminist and inclusive causes. Speaking of stronger bonds, all of us staying home enjoyed a nice breakfast on the day after the MOTY award show with members of staff and volunteers. Other than that, we did predictions on the World Cup games (congrats Katie!) 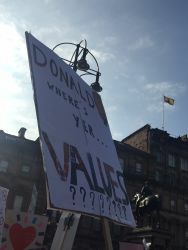 and, my personal highlight, we protested against Trump’s visit to Scotland in the City Centre with placards we had created ourselves! With all of this release of tension, my schedule became much quieter. 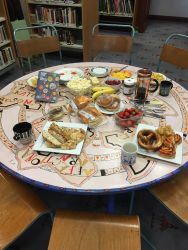 If you have come to the library this month, there is an exceedingly high chance you were greeted by me at the reception. Hello again! Other than that, I worked quite often autonomously for the National Lifelong Learning Project. For the kickstart of our new Women in the Landscape research project, I had previously compiled extensive research notes and now it was my job to compile a so-called list of resources. A list of resources is a document, which gives a structured overview on books and other potentially useful resources on a specific topic. My list of resources has become quite long and covers all different kinds of media: fiction, poetry, scientific books on customs or life in the countryside, interviews with female farmers from recent years, movies about women in the landscape… So if you are interested in this topic or you are intending to do research of your own and need a handy shortcut for finding literature (trust me, I feel you, we have all been there), then keep your eyes peeled for the publishing of the online resources this autumn. On a side note: if you know potential resources that may be added to the list (not only about Scotland! ), don’t be shy and write to me. You can always reach me at GWL at: jeanette.lang@womenslibrary.org.uk. See me ironing on letters for our suffragette sashes. 2018 marking the centenary of women’s right to vote in the UK, of course the suffragettes did not leave me this month either. I took my first baby steps in researching people’s lives and I am about to edit an interesting article on two suffragettes that have barely received attention in historic research. More on that later! Other than being absorbed in newspaper and census archives, I also got crafty. 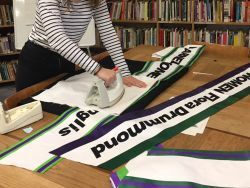 As Morag was to visit the women in Greenock prison for an enactment of a Women’s March there, she kindly asked me if I could recreate some suffragette sashes like the ones from our March of Women project that had been added to our museum collection and are too precious to be worn again. Long story short, but despite my mother teaching me some sewing a few years ago, I discovered a whole new and, dare I say, very crafty side of mine. But have a look for yourself. Before I end my blog post, I would like to draw your attention to some events I attended at GWL this month. GWL has an amazing reputation for its so-called Heritage Walks, guided tours around different parts of Glasgow which highlight women’s contributions to the city’s history but also the hardships they faced. Out of our six walks, I attended the Merchant City one, the Necropolis one and the West End one. All of them were extremely worthwhile and also my friends visiting from Germany recommend them. Needless to say you should definitely book your space as soon as possible – and I should also bring your attention to the development of our new trail, a suffragette trail. Recently, we set up a team of Women’s History Detectives who are doing their research for it but we welcome new people at any given time. You do not have to be an expert on the suffragettes or even in research. We, and especially our team leader Heather, are here to help you. Contact GWL if you are interested. Find the dates of our meetings here. Another event series that deserves mentioning is Histories of Reproductive Health and Activism. On the first occasion, Professor Naomi Rogers (from Yale University) delivered a truly captivating lecture on the historical trajectory of reproductive health and jurisdiction on it. Do not expect it to be the boring 90-minute talks students warned you about because it is not. You will be given nail-biting facts and unforgettable anecdotes from the health sector instead! That is it for now. I hope you enjoyed reading about my experiences and come back for my August blog post. What will be on the menu? A short report on holidays in the Highlands (inspired by my research for the Women in the Landscapes project), the Edinburgh International Book Festival and my very first Story Café on the 16th August. Feel free to come along as I will be reading out a part-fiction, part-factual biography on Mary MacPherson, a Gaelic singer. Jeanette is an Erasmus intern at Glasgow Women’s Library and involved in the National Lifelong Learning Project and Story Café, among other projects of GWL. She started in April and will stay until early October. Her internship here is part of her studies of English and Gender Studies at the Saarland University in Germany, where she grew up, and is supported by Erasmus. 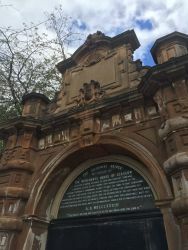 This entry was posted in Glasgow Women's Library Podcast, News, Past Events, Placements and Volunteers Blog, Volunteers and tagged with GWL, Heritage Walk, moty, Museum of the Year, National Lifelong Learning, Story Cafe, Suffragettes, Trump, volunteering.